I was hoping to post yesterday, ON World Diabetes Day. . but there was so much going on, my husband had taken a vacation day. . and honestly, I just didn’t get around to it. Each year, this day seems to change for me. My very first WDD was in 2009. I was new to the DOC (Diabetes Online Community) and had just started finding blogs and people to follow on twitter. I had started forming some relationships with others and was so excited when Cherise asked me to attend a luncheon downtown. I couldn’t wait to meet her. .afterall, she was one of my DOC heroes and she wanted to meet ME! OMG! Not only did I get to meet her, but also Scott, Sir Bob and Sarah Jane to boot! It was fantastic! That WDD was a small circle of this new community I had joined. . all of us banding together in blue. . sort of like musketeers. . all for one and one for all! Last year. . that circle grew. My hubby and I did the Big Blue Test, I spent the day on twitter, chatting it up with this larger community I’d become a part of. My workplace was quite aware of WDD as I was all dressed up in blue, wore my IDF pin and shared the news with them all. This year, that circle grew even bigger. Not only have I met even more of my twitter “rock stars” this year, but WDD spread throughout the rest of my community as well. I had friends from church, family from out of state, people I know through DH’s civic responsibilities. . so many people joining in, wearing blue, sending photos and cheering us on. I think, however, I’m most proud of our first step into advocacy this year. DH sent an email to his HR department, asking if something could be done to recognize Diabetes Awareness Month. They were delighted to help and setup a dress-down day in which employees could donate for the privilege of wearing jeans to work. I sent over some additional information about diabetes programs and WDD opportunities. The whole company chipped in and we were able to make a donation to Diabetes Hands Foundation. YAY! 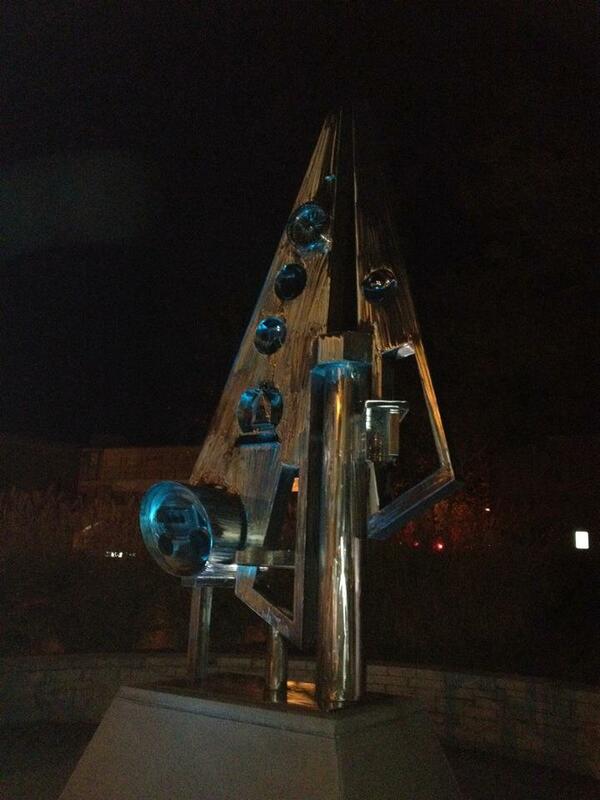 Additionally, following a civic meeting, DH mentioned to TD of City PR and Communications, that we would like to talk to him about turning the Olathe City fountain blue in honor of the month. Again, I sent over information about Diabetes Awareness Month and WDD and the IDF Monument Challenge. Wouldn’t it be great to see OUR city on that list of monuments?! Wow! Unfortunately, the fountain was scheduled for winterization, however, TD forwarded our request to others to see what could be done. We were thrilled to hear that the monument in front of City Hall would be lit in blue lights this month! I forwarded the news to the IDF and within a few hours, the list read: United States, City Hall, Olathe KA. And here it is. . .
My diabetes world has grown exponentially over these past two years. We felt so alone that first year; not knowing anyone else dealing with diabetes. . until twitter and the DOC changed all that. My diabetes world has gone from that small, lonely existence to being a worldwide family! I’ve met fellow PWD from everywhere! I’ve gotten my little city, recognized on an international level. I’m feeling pretty happy with the growth I’ve experienced; but not satisfied. I now imagine what is possible if I will just try, ask, be willing to hear no. I remember years of sales training telling me the only deal you won’t make is the deal you won’t ask for. I won’t be timid anymore. I will ask. . . again and again. I’m hoping next year I can plan a formal “Lighting” ceremony at City Hall, with vendor tables, information booths, PWD from all over Olathe, coming to hear about the advances that have been made, new ways to self-manage their diabetes and letting them know that support is available to them 24/7, maybe a flash mob event and offering them the opportunity to participate in the Big Blue Test. After that? Who knows. . . I’m still dreamin’. You are awesome! I still think the “winterization” of the fountain is a pretty awesome part of the story! I need to start thinking of “bigger and better” for next year too!